The mission of the GPS committee is to provide resources and opportunities to support the social, emotional and financial well-being of graduate students at Western University. GPS offers weekly drop-in Grad Peer Support on Wednesday afternoons (2:30-4:00pm) in the SOGS Office (Middlesex College, Rm. 8) Mutipurpose Room. Email gps@sogs.ca if you have questions or cannot attend. Overseeing the Food Bank Program for Non-TA Members; this project provided grocery store gift cards to non-TA members facing financial need. Notably, PSAC 610 runs a similar food support program for TAs. Reviewing applications to the Wellness Joint Fund, a project managed by SOGS which provides funding to wellness initiatives organized by departments, student groups, and other member-affiliated units across campus. 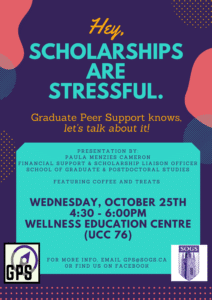 GPS invites everyone to the WEC for a presentation and chat about Scholarship Stress. Presentation by Paula Menzies Cameron, Financial Support & Scholarship Liaison Officer, School of Graduate & Postdoctoral Studies (SGPS). Coffee and treats will be available. GPS invites you to join us for four microteach sessions (15 minutes each) on useful skills to support your graduate studies. Confirmed topics include: stress management, time management, healthy communication, and wellness. The hour of microteaches will be followed by snacks and refreshments.